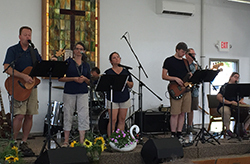 There are several ways to participate with the Fulton County Christian Music Ministries as we carry out God’s plan for sharing the Gospel and bringing the music programming to the Fulton County Fair. Attend a board meeting to listen and better understand the ministry. Make suggestions for the growth of the ministry. 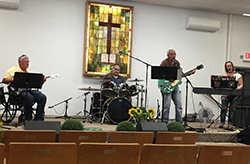 Become a board member to be a part of bringing Christian music to our community. 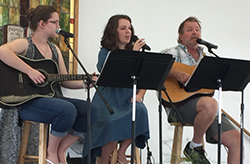 Inform us of musicians (worship teams, musical groups, families or individuals) to give of their time and talents to minister during the county fair. The ministry supplies the sound system and technician. Underwrite a day for $250. 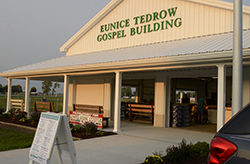 Each church that supports is recognized on the website, the printed schedule and on a board in front of the Christian Music Ministries Building. Churches can provide hosts that might be greeters, hand out water and fans, and pray for needs as they arise. The Lord may impress upon each person how to serve so His ministry would be carried out. Donate money to pay for mailings, advertising, printing costs and the cost of our website: fccmm.org. Financial help is needed throughout the year to acquire musicians for the highlighted concerts with national music groups. We have financial statements and the projected budget available upon request. Contribute to freewill offerings taken, especially on Sunday, to give financial support. Attend the concerts and be encouraged in your relationship with the Lord. Above all else, pray for the board and ministry. We desire to serve the Lord where He leads. May all who are involved find the blessings of the Lord to be present in their lives.